The first approach looks like this: light tapering 1:8 twist barrel, muzzle brake and charging handle by Strike Industries, ambi safety by them also. Mission First Tactical grip and stock, carbon fiber forend by Brigand Arms. Improved trigger. Lancer magazine. Lasermax micro laser as backup sighting option. Trijicon mini ACOG 3×24. Magnesium lower courtesy of Fostech, same as on their upcoming ultralight carbine. The combined result is light, handy, and should be fairly accurate. Overall design and awesome Cerakote job by Fighting Sheepdog of Knoxville, TN. 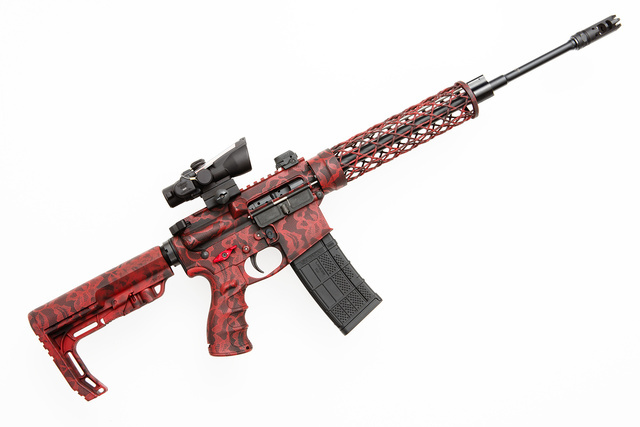 This entry was posted in light/laser, rifle, weapon and tagged 223, AR15, optics, scope. Bookmark the permalink. The only thing I would like to add to my 2 AR rifles and pistol is a NOT SO DARN EXPENSIVE 2-stage trigger. Seriously, give me a break. Single stage trigger averages $25-$75. 2 stage trigger – $100 to $260. There isn’t that much difference in the parts. I’ve looked at the drawings. Slight differences in the trigger and disconnector.